Labor party to choose between Shelly Yechimovich, Yitzchak Herzog. Analyst: Both would support government. The Labor party is holding primary elections Thursday. The party’s 55,113 members who are eligible to vote will choose between the current party head, MK Shelly Yechimovich, and MK Yitzchak Herzog. Voting is scheduled to begin at 10 a.m. Voters will be able to cast a ballot at any one of roughly 80 polling places, and will not be limited to the polling area closest to their house. Voting will end at 10 p.m. The party will be taking special steps to avoid elections fraud: during the day, private investigators will circulate among the polls in civilian clothing to ensure that the elections are being conducted honestly. The precaution follows allegations of elections fraud in multiple cities, among them Netivot, Haifa and Beit Shemesh, following the recent nationwide municipal elections. An analyst who spoke to Arutz Sheva this week said that both Yechimovich or Herzog support Prime Minister Binyamin Netanyahu if the Jewish Home (Bayit Yehudi) were to leave the government in protest of concessions to the Palestinian Authority. The analyst, former Labor party spokesman Lior Robert, explained that either leader would feel obligated to support the government if Israel-PA talks were threatened. 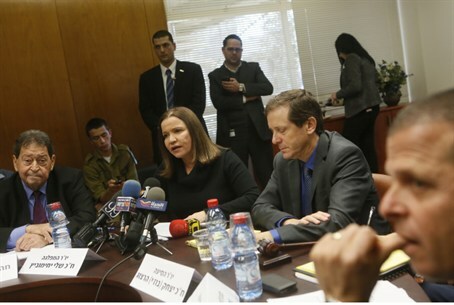 However, he said, Herzog may be more likely to choose support from outside the coalition, which Yechimovich has declared that she would be willing to replace the Jewish Home as Netanyahu’s coalition partner.